Gayle Lynds has done it to me again. Her new thriller, The Assassins, a July release from St. Martin's Press, opened, grabbed me by the throat and kept me up late two nights in a row. As much as I love sleep, this is a superb read and one missing a few hours of sleep over. The story opens in 2003 with the assassins, who each had done jobs for Saddam Hussein and none had received their final payment before Saddam was ousted. That's just not the way to do business with these guys.The usual operating procedure for an assassins contract is to be given half of the agreed monies with acceptance of the contract and the remainder when the job is finished. Seems Hussein liked to stiff on a contract or he had too many problems to take care of business. Eventually, they are contacted by one of their number who has located a General, who had been in the Special Republican Guard under Saddam. The General says he can get them into the National Museum of Iraq in Baghdad, before the Americans arrive and where they can steal a priceless antiquity which then may be sold for billions of dollars.They can divide the money and go happily on their way. The assassins don't know each other personally, but they are acquainted with each other's work. None would trust the others with the theft so the plan dictated all would be in on the heist. Every thing was working fine until...okay, I won't spoil here. Next, enter CI agent, Judd Ryder, last seen in The Book of Spies. And Eva Blake, who was a book curator in Book of Spies who is now training to be a CIA operative. Together with Judd's old boss and mentor Tucker Andersen and various CIA pals there is a concerted effort to discover what the assassins have been up to all these years later. Judd and Eva had dealt with one assassin The Carnivore once before and nothing was exactly fun and games. But they are soon drawn into the fray even without trying. From Washington, DC to Paris, to Baghdad to Marrakesh the assassins are pitted against each other because everyone wants a piece of the missing billion dollar fortune. With Eva and Judd trying to unravel the plots and counter-plots while caught in the crossfire of men who think nothing of killing for money, you are swept along and reading pages as quickly as you can. 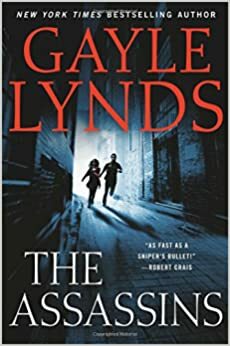 Gayle Lynds is one female thriller writer who had the background and knowledge to write a spy thriller as good as anyone. Don't ever tell me women can't write thrillers. I would love to write one myself, but I honestly have no education, training or knowledge for espionage. Gayle Lynds worked for a think tank in Washington and is a member of the Association of Former Intelligence Officers. She was married to the late Dennis Lynds who wrote wonderful spy and mystery stories and books. She worked with Robert Ludlum. Gail and David Morrell co-founded International Thriller Writers. So it's no wonder she doesn't write LIKE a girl. Which is a dumb way to speak of any writer, I've read many thriller books by women. Look it up if you don't believe me. Two years ago, Gayle met and married John Shelton and moved from CA to Maine. John is a former prosecutor, defense attorney and judge, and writes articles for Law Journals. She says John is her first reader and helps with certain legal fact and brain storming.. Oh yeah, she and John have collaborated on three short stories. She has traveled overseas to research the great locations in her books. I learned much about cities and countries I've never been able to see. She captures all the sights, sounds and feelings of those cities. If you've never read Gayle Lynds before, try The Assassins, The Book of Spies, The Last Spymaster, The Coil, Mesmerized, Mosaic, or Masquerade. With Robert Ludlum: The Hades Factor, The Paris Option, The Altman Code. If you like spy thrillers like I do, you'll definitely enjoy everything by this talented writer. A little personal note: Tomorrow returning from a Grape Family Reunion. Yes, I know, a bunch of Grapes, descended on Memphis, TN I'll have to tell you about it next time and maybe I'll have pictures, too.